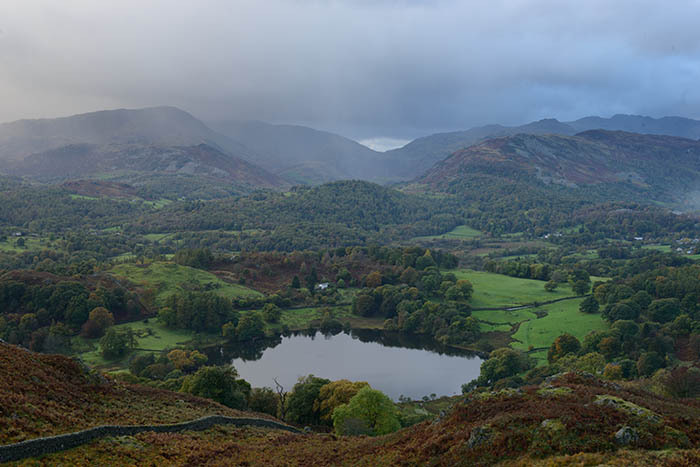 In autumn last year I visited the Lake District for four days. It was a brief visit but I planned to pack in as much photography as possible. The last time I’d photographed the fells was four years prior so I was really looking forward to being back, particularly to see the autumn colours. Opting to sleep in my car rather than in a hotel or B&B kept costs for the trip down and meant that I could stay out at a location overnight. This approach paid off in allowing me to get to places quickly for sunrise. However, by the end of the the trip I was tired – a hatchback Skoda Fabia does not rival a bedroom for comfort! About half of the sunsets and sunrises I’d photographed were mired by cloud or rain. And for those that weren’t a washout I didn’t feel like I was in the right head space for taking pictures. Consequently I felt like I hadn’t achieved much with my time. Try again: I didn’t feel inspired by such flat light at sunrise. 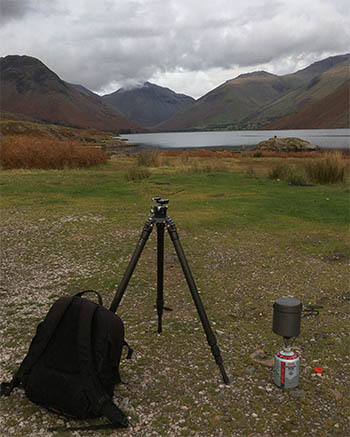 My luck changed dramatically at Wast Water, which was my last destination for the trip before I made the long drive home. The forecast for sunset was looking good with some cloud in the west but mostly a clear sky. 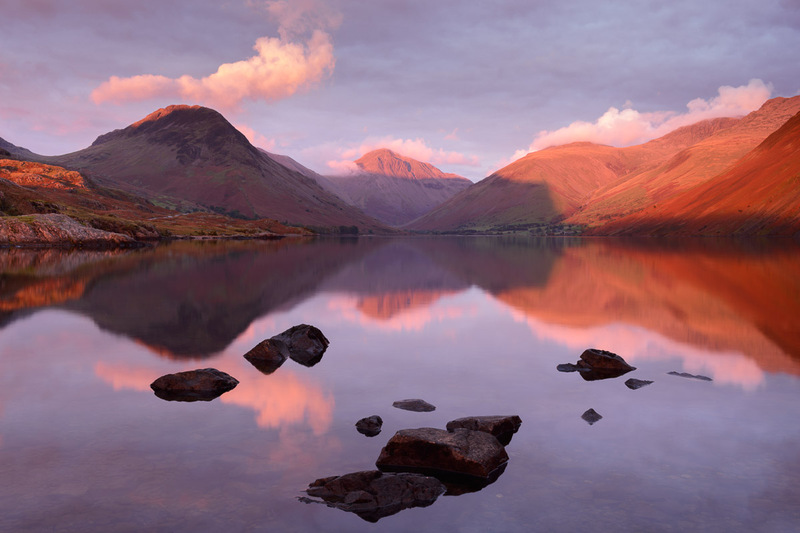 After a long, snaking drive over the Wrynose and Hardknott passes I arrived at Wast Water a few hours before sunset. En route the weather had worsened and the sky had become blanketed in cloud – so much for the clear sky that was forecast! I resigned myself to not taking any more pictures during the trip as I was sure that the remainder of the day would be grey and uninspiring. I wandered down to the edge of the lake with my camera in hand. I’d photographed the view before, several years prior, so it was familiar. With a little stopper attached I was able to lengthen the exposure just enough to smooth any ripples on the water’s surface. It’s in vogue to heavily blur water by taking exposures lasting several seconds and I favour this approach as it smooths out any ripples or textures, which I find distracting. After this shot I intended to pack up my camera for the last time, step back and enjoy the view for a while. A few minutes later I’d returned to the car, unpacked my stove and boiled some water to make tea. When it’s cold and wet outside tea transports me to a warmer, brighter place. I used to pack just a bottle of water with my photography kit and survive on that while I was out with my camera. My wife is a connoisseur of tea and she never goes on walks without bringing a flask with tea bags. This practice has influenced me and I now often bring tea with me on trips. My what a difference it makes! With my hot tea in hand it wasn’t long before my outlook changed. I didn’t mind the grey any more. Soon I noticed raindrops on the surface of my tea. I looked up and realised it wasn’t just raining over my mug but also on the landscape in front of me. “Ho hum, that’s definitely the end of this trip” I thought to myself. Letting go of all hope of photographing the scene left me feeling quite relaxed. I turned my attention to the sound of raindrops pattering on my jacket. 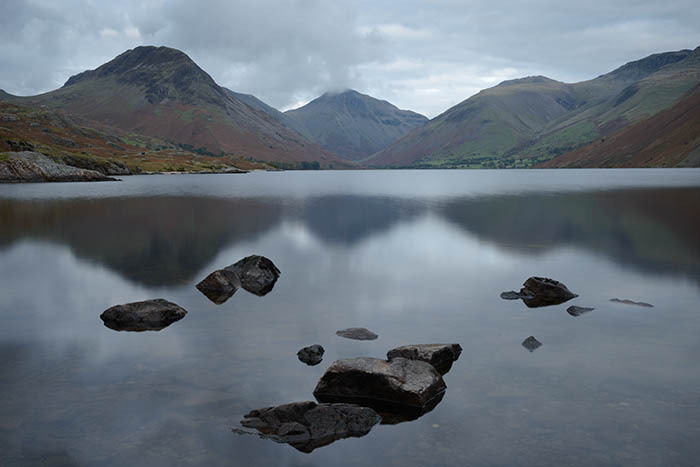 The rain grew steadier and soon the calm reflections of Wast Water were distorted by the ripples of droplets. I donned some waterproof trousers and decided to stay where I was; it didn’t matter that I was getting wet, I was quite enjoying the moment. While gazing at the peaks of the mountains I noticed a faint orange glow highlighting the top of Great Gable. This was the only sign of colour for miles so my senses were heightened by its appearance. Wondering where it was coming from I swung round to look in the direction of the sun. To my surprise and delight there was an orange glow on the horizon. Somewhere to the west there must have been a patch of clear sky with the sun shining through. I could see the orange growing, skirting across the entire view before my eyes. If you imagine photography to be a sedate pursuit where one takes their time and doesn’t rush, the moments that followed represent the antithesis to that notion. I grabbed my camera backpack and tripod and ran as fast as I could to the water’s edge. I knew exactly where to head as the composition I’d selected for my earlier picture was good. Instincts take over at such times and within a few seconds I’d set up my tripod, attached the camera to it and composed the shot. The sun came out and suddenly the mountains gained red heads. Purchase this picture as a print. For another six or seven minutes the light show continued. However, I didn’t spend all that time photographing it. Instead I stopped and enjoyed looking around for a few moments. I remember something that photographer Andy Rouse said at one of his talks: when we are engaged in photography we don’t properly remember what we’re seeing so it’s important to put the camera down and enjoy the moment. I could relate to this as before now I’ve photographed every moment of a colourful sunset but by the end of it I couldn’t remember much of the experience. The glorious orange light gradually diminished until the view returned to grey. I walked back to my car feeling very lucky. This kind of sunset happens only a handful of times each year and hardly ever when I have a camera with me or when I’m at a good location.